Plexus | Connecting the right companies together. Connecting the right companies together. We leverage our domestic and international network, professional experience, industry knowledge, and synergistic vision to bring companies together that wouldn’t normally cross paths. We work to fill-in the White Space. We work strategically to complete the void left when unique and innovative solutions only solve an isolated portion of a bigger problem. Personal Training for your business. We help shape young companies for high performance in expanding operations for exits or mergers and existing companies with the innovation and strategy they need to get to the next level. 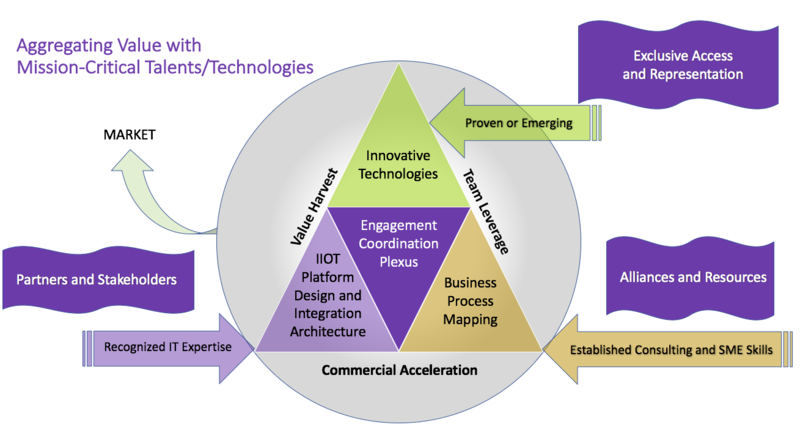 Plexus helps frame sustainable and scalable strategies for established and young companies alike. Guiding both mature and emerging companies, we help them capitalize on cutting edge technology, high performance in expanding operations, addressing changing market conditions or for preparing them for exit, mergers and acquisitions. Just like a personal trainer, but for business fitness, we operate in the industrial software and services space for Process Industry for Asset Maintenance and Operational Intelligence and Efficiency. Benefits of our in-depth knowledge, experience, and network in the process industry and markets are passed to clients. Strategic activities that include identifying technology gaps and weaknesses and crafting actionable plans for turning those weaknesses into strengths through partnering and collaboration. A large corporation may need a more comprehensive strategy, while they have individual business units that under perform due to technology and/or portfolio gaps in product and services. Setting up a program of transverse solutions enables well established companies to become more agile and responsive once again and thus increase their market share. Tactical activities that include focused sales messaging, product positioning, raising market awareness, and development of detailed business plans for individual products or services and critical workflow-driven solutions. We match up our clients with complementary technology and service companies to identify and fill white space in conceiving and delivering a ‘Solution Continuum’ that better address operational efficiency challenges that often directly affect our client companies’ profitability. Scouting for the investor community needing assistance in identifying potential placement opportunities in high-growth areas. We pair our market and technical expertise with potential investors for raising growth capital. As advisors to investment bankers in the packaging one or more of our clients for acquisition by identifying and qualifying potential suitors, helping as match-makers, negotiating terms sheets and supporting the due diligence process. We believe that companies with great ideas, no matter what size, ought to have a chance to succeed. Too many times, great ideas and products fail for lack of resources, talent, and synergistic opportunity to shine. Established companies often struggle with innovation, leaving opportunity for other players and competitors to enter the market. This presents creative partnering potential to yield greater competitive differentiation and acquisition opportunities. Emerging companies often need assistance in expanding their vision, resources, and network to develop project opportunity awareness. Additional difficulty often arises when trying to identify partners in international markets where there is adapted compelling message and focused selling arguments. Capital Investors are looking for placement opportunities and guidance or scouting services. We’ve taken a wealth of experience from our careers, and now is the time to start giving back. Point source solutions become more powerful when augmented with complementary people, processes, technology, and tools. Often, unique and innovative solutions only solve an isolated portion of a bigger problem and don’t capture the complete value of a fuller opportunity. We call this White Space - the open blank areas of the required solution that have not been properly addressed. By combining singular technologies and services, we often get a multiplier effect in value. An example is computer-aided inspection of mechanical systems that includes mobility platforms, augmented reality, situational awareness and operating procedures, just in time training, safety systems, and work permitting. All of these are separate areas, delivering efficiency gains to the market when combined. We leverage our domestic and international network, professional experience, industry knowledge, and synergistic vision to bring companies together that wouldn’t normally cross paths. We focus on the industrial space with the goal of delivering increased operator productivity, while providing them more safety and consistency, with the extra benefit of compliance and reporting mechanisms. If you’re a CEO or business unit leader, we can help identify solutions to accelerate your business into higher sustainable growth. Owner/Operators of complex Process Industry plants are concerned with Operations Excellence, Safety, Integrity Management, Condition Monitoring, and optimizing production through performant solutions and processes to be able to operate more profitably and safely. All members of the supply chain have a place in meeting this market challenge. We work with companies that have a developed product or service for the industrial space. From international industrial giants, to companies with turnover that ranges from $1m/year to $100M/year. Very often we will work with product companies needing service offerings, and service companies needing products. In addition, we work with investors to pair with suitable product and service companies. Investors include members of the Fortune 500 and the investment banking community. We use a defined set of rules with timing, scheduling, terms and conditions. This begins with a discovery and mind-sharing workshop over several days. Marc deBuyl has worked in the process industry for over 40 years beginning his career as a geoscientist focusing on integrated reservoir modeling. He has significant experience in business process modeling for the Oil and Gas and Energy sectors and has been delivering value and products through a variety of channels. As a general manager, he has led media companies, technology companies, and systems integration companies to achieve more than thought possible. As founder and CEO of several technology startups, he has managed successful exits to the benefit of all parties. Marc helped manage the sales of VRcontext to Siemens to provide an innovative product that leveraged a number of Siemens’ businesses and product lines. In his prior career, Marc lead Integrated Reservoir Research at Western Geophysical (now a Schlumberger company), where he filed and published numerous patents and articles, and co-edited books and memoirs, sponsored by AAPG, SEG and the SPE, where he was honored to serve as a Distinguished Lecturer. Marc holds multiple degrees, including Bachelor in Science and Masters in Geology from the University of Brussels. He also pursued post-graduate studies in Geophysics at the Colorado School of Mines, and an MBA program, endorsed by the London School of Economics. Ron McLeod has worked in the knowledge industry for over 39 years as a project manager, practice manager, and sales executive in the areas of real time industrial operations, mapping, transportation systems, IT infrastructure, and document management systems. He has experience in both the public and private sectors, and has achieved significant success in driving business value by marketing and delivering mission critical software and service solutions in the commercial and federal marketplace. Experienced in applying technology to VP level business problems, he has been successful in translating the technical jargon and features to provoke buying decisions. In a number of roles throughout his career, he has made a significant impact in the areas of sales and sales messaging, consulting services delivery, engineering and design systems, GIS/Mapping, enterprise asset management systems, information technology applied to the oil and gas, construction, power, water, chemical, pulp and paper, mining, and ship building industries. Ron has degrees from San Diego State University, has several publications, and is certified in Pragmatic Marketing and INBOUND Sales and Marketing. Our principals are supported by a diverse talent pool of C Level partners, domestic and international that serve as our panel of advisors. Led Honeywell in the development and execution of a worldwide sales team for advanced software. Business growth from $50M to over $300M with offices worldwide, global client base including all the super-majors with tight integration with the broader Honeywell Industrial Control segment. Led AspenTech in driving business with EPCs (Engineering, Procurement and Construction), and, leading the Global Accounts Program at AspenTech. Critical deployments of technology and services for Operational Effectiveness. Strategic agreements with software partners including many exits to Austin Ventures, Battery Ventures, Yokogawa and others. Founding Partner in Energy Water Solutions – treating PRODUCED Water from Oil and Gas and creating beneficial use products including fresh water, brine and heavy metals to clients both inside and outside the field of Oil and Gas. Dr. Shemwell, Managing Director of The Rapid Response Institute, is an authority and thought leader in field operations and risk management with over 30 years in the energy sector leading turnaround and transformation processes for global S&P 500 organizations as well as start-up and professional service firms. He had been directly involved in over $5 billion acquisition and divestitures as well as the management of significant projects and business units. He has authored over 300 articles and presentations including six books including: Essays on Business and Information, volumes I & II, Implementing a Culture of Safety: A Roadmap for Performance Based Compliance as co-author as well as Governing Energy: Organizational Governance—Issues of the 21st Century series (2012-2013 & 2014-2015 Editions) and Structural Dynamics: Foundation of Next Generation Management Science. He also serves as a member of the Penn Energy Research Advisory Board and has been affiliated with that firm for more than six years in a formal capacity. He has been a thought leader in the use of data and information enabling operational excellence for over twenty years. Recently, his firm spun out OARS360, a mobility enabled solution in support of Regulatory Compliance and Contractor Management. Dr. Shemwell holds a Bachelor of Science in physics from North Georgia College, a Master of Business Administration from Houston Baptist University and a Doctor of Business Administration from Nova Southeastern University. Philippe is an executive-level leader with experience conceiving and integrating profit-producing strategies for globally renowned organizations using business intelligence, technology platforms, and entrepreneurial mindset. His executive talents are in team leadership, consensus building, strategic planning, P&L management, financial forecasting, budget planning, business development, sales/marketing plans, business networking, contract negotiations, account management, problem resolution, and change leadership. Philippe employs a global vision with experience working in collaboration with large international teams around the world. He is bilingual and bicultural in French and English with more than 20 years in the USA (dual national). His astute project management skills are demonstrated through high-stakes integration projects, including current involvement in a billion-dollar digital oilfield project for Baker Hughes and previous experience coordinating and reporting key technology factors for the Salt Lake City Olympic Games. He is skilled in directing technology infrastructure design in support of global operations, critical business analysis, and real-time reporting with goal of facilitating intelligent decision making. Philippe maintains solid relationships with extensive experience in establishing channel network and senior-level contacts, being able to leverage network connections to build alliances and generate sales. As a business co-pilot, Fred profitably grows companies both organically and inorganically. Fred strives to insure long-term sustainable results, develop winning strategies, build the tactics to succeed, assist leadership to rally the organization, focus on operational excellence, lead the change agents, evangelize the change, navigate to new alliances, develop new business relationships, and/or lead mergers and acquisitions. If necessary, Fred is capable and willing to step into the chief executive or a business unit leadership role. His specialties include: Leadership, Business Development, Global Team Building, Client Development, Go-to-Market Strategies, Product Development & Launch, Program Management, Project Management, and Consulting in the following industries: Oil & Gas, Utilities, Chemicals, Pharmaceuticals, Life Sciences, Paper and Steel, Mining, and Transportation related to Software Solutions.